Engine Four stroke, parallel twin cylinder, push rod 2 valves per cylinder. The parallel-twin four-stroke engine is an integral part of British motor cycling history, and in recent years the two mainstays of the British industry relied on this layout, the particular machines concerned being the Triumph Bonneville and Norton Commando. Although basically similar, the engines of the two bikes differed somewhat in character with the Norton engine seeming a lot more powerful and 'gutsy' low down. Very much an undersquare engine, it was not surprising that torque was its strongpoint and that the engine became rather breathless above 6000 rpm. As might be expected, the simple and reliable pushrod-and-rocker valve system was used, along with a mild 8.5: 1 compression ratio. The Commando was not short of power, however, and developed 58 bhp at 5900 rpm from its 828cc, enough to give it a very respectable performance. Breathing through two 32 mm Amal carburettors, it could also be very economical, with fuel consumption reaching anything up to 60mpg. The engine was coupled to a four-speed gearbox which, even with the ample power available, still had one ratio too few. The gearchanges and clutch action were remarkably light, and made for quick and fuss-free cog swapping. The Commando Isolastic frame was a tall and narrow duplex design, featuring rubber mountings for the engine which helped to insulate vibrations above 3000 rpm. Not surprisingly with its racing heritage, the big Norton was very much at home on twisty roads, with its well designed steering no doubt helping to make it handle neutrally and safely in any situation. The last Mk III Commandos were somewhat softer than their predecessors, with inferior performance. The top speed of the Mk III was, however, a creditable 110mph with a standing-start quarter-mile time of just over 14 seconds. The average fuel consumption was 45mpg, and consumption did not drop much below that figure even if the bike was ridden hard. It was obvious in later years of its life that the Norton company was pandering to the tastes and demands of the American market with the bike. This was emphasized by the machine's electric start system. For many years, Norton enthusiasts ! developed strong right legs for starting their machines, but the mid-1970s American market dictated that a push-button system would not only be acceptable but essential for their large share of the Norton production. So, such a system was fitted, the only problem being that it was hardly powerful enough to get two 360 degree, 424cc cylinders into action. The Americans were happy, for the bike displayed the legend 'Electric Start' on the flanks and the dealers took it seriously; weaker riders could always use the button in conjunction with the kick starter so things were not too bad. Once under way, the Commando was a .superb riders' machine, for it cornered very swiftly and stopped equally quickly in wet or dry, the single Lockheed discs front and rear making light work of hauling the 430 lb bike down from high speeds. Although in its Mk III guise the Commando was not as quick as its predecessors, it was still a well-loved and capable machine. 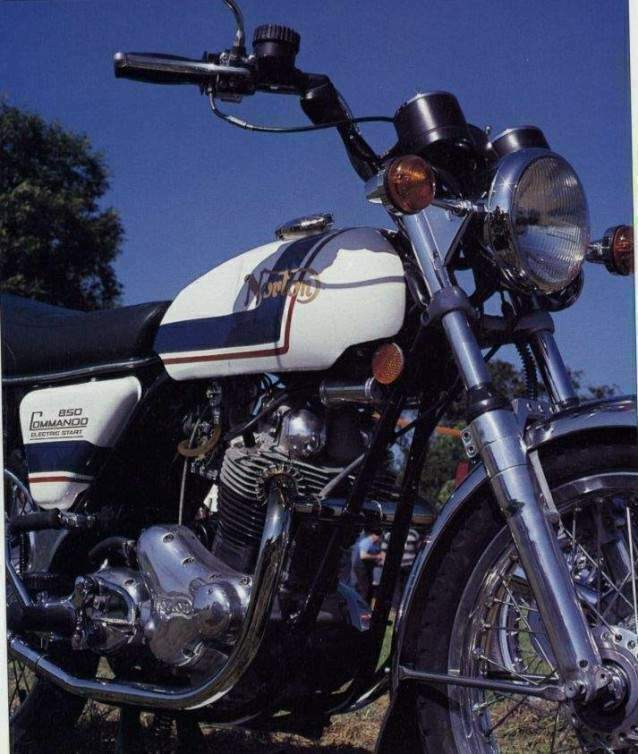 NVT, however, decided to concentrate on the more modern, three-cylinder, Triumph Trident and so the Commando was quietly dropped. 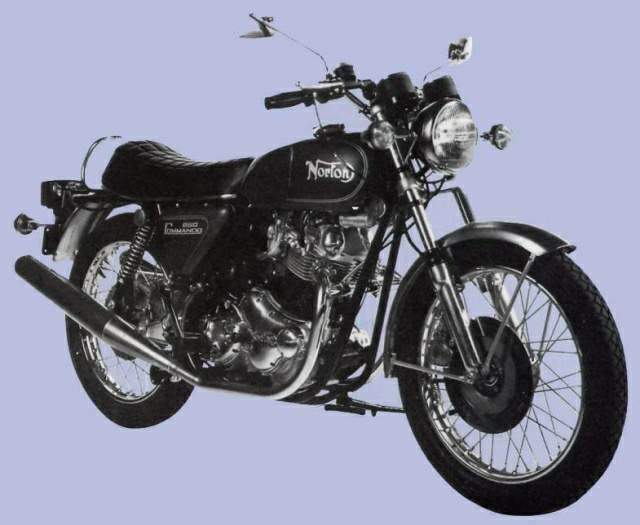 Not long after that the triple itself went out of production but the Norton name was left for the Wankel-engined bike upon which so many hopes for the future of the British bike industry rested.